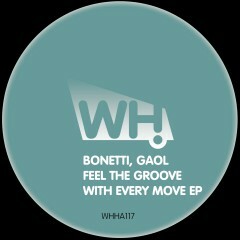 Hailing from the Balearic Islands, we proudly bring you the new EP from Bonetti and Gaol. Bonetti is a talented DJ born in Palma de Mallorca where he has performed as a resident DJ at Pacha Mallorca and more. He turned to music productions in 2010 and his tracks can now be found on labels like Unquantize, Pura Music and Piston Recordings. Gaol has been involved with electronic music since 2008 where he finished his degree in sound engineering. He launched his Gaol moniker in 2013 and hasn’t looked back since. He is now signed to Sub_Urban, Depaart and StonedDogs Records to name a few. The guys team up to bring us their Feel The Groove With Every Move EP. The title track comes in two different versions. There is a deep mix or the original to choose from. The second track is called Old School Biz. Prepare yourself for a journey of deep and jacking stuff for the floor.